A few months ago I wrote this article at the World Economic Forum called “A Yellow Card For The Global Economy“. It tried to serve as a warning on the rising imbalances of the emerging and leading economies. Unfortunately, since then, those imbalances have continued to rise and market complacency reached new highs. This week, financial markets have been dyed red and the stock market reaction adds to concerns about a possible impending recession. Global growth estimates trimmed for the sixth time in as many months. Therefore, the US rate hikes – announced repeatedly and incessantly for years – are not the cause, nor the alleged trade war. These are just symptoms, excuses to disguise a much more worrying illness. Therefore, a dose of reality was needed. Monetary policy not only disguises the real risk of sovereign assets, but it also pushes the most cautious and prudent investor to take more risk for lower returns. It is no coincidence that this policy is called “financial repression“. Because that is what it does. It forces savers and investors to chase beta and some yield in the riskiest assets. Three examples of the market lunacy: Iraq, a country that has been all but devastated and in constant turmoil, issues a 2028 bond at 5.8% yield, lower than some developed markets only six years ago. Argentina issued a 100 year bond with an 8.5% yield. A country that in the previous 100 years before issuing this bond defaulted more than eight times. The $2.5bn issue was oversubscribed 3.5 times, which shows how credit investors are more than hungry for any kind of yield, as global negative yield bonds currently surpass the $6.5 trillion figure. With Europe and Japan giving negative nominal and real yields, and central banks buying a combined $200 bn a month of assets, there was massive real demand for some yield. None of the eurozone countries’ sovereign debt yields show a realistic combination of risk and return. With 19 countries yielding negative real returns, the evidence that there is no real demand for those bonds at these levels is that the ECB is considering an “operation twist” to avoid the inevitable reckoning of rising real yields as the quantitative easing unwinds. In Europe, no investor would buy bonds of the eurozone states with these coupons in a normalized environment. This has led to higher risk assets in fixed income discounting a spread of only 290 basis points over a sovereign bond that is already massively inflated. That is the creation of a huge bubble instigated by central banks with its reckless policy of ignoring the risks that they encourage in the markets. China reminded us that the tale of synchronized growth was false and that what we have been seeing in recent years has been synchronized growth … of debt . When China devalues the yuan and introduces the biggest tax cut in 38 years and a constant monetary stimulus to bail out its banks, what is it really telling us? That everything is fine? 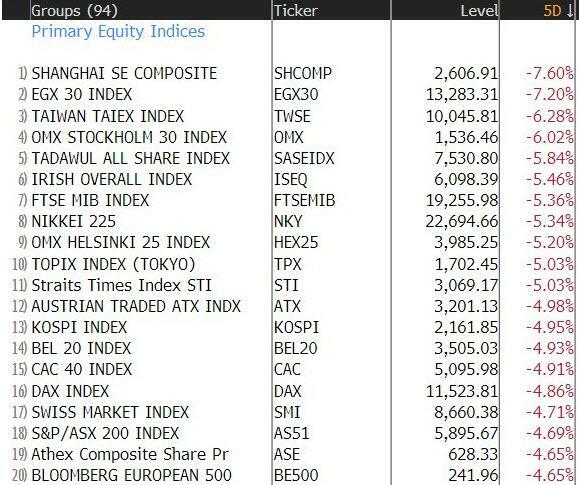 No, that things are not going well with the Asian giant No economy launches a massive undercover bailout of the financial sector, cuts rates and implements huge tax cuts as well as devaluing if everything goes smoothly. The realization of the fallacy of synchronized growth has also brought down expectations of global growth. And with it, corporate profit estimates. Markets, suddenly, look as expensive as many have warned when the combination of China devaluation and soaring US yields shows the extent of the accumulation of risk of the past years. The cracks in the building always appear first with currencies. Countries that have become accustomed to the idea that “this time is different” and that debt does not matter, started to multiply their indebtedness in foreign currency. Debt in dollars from emerging countries soared to 41% of their total debt. 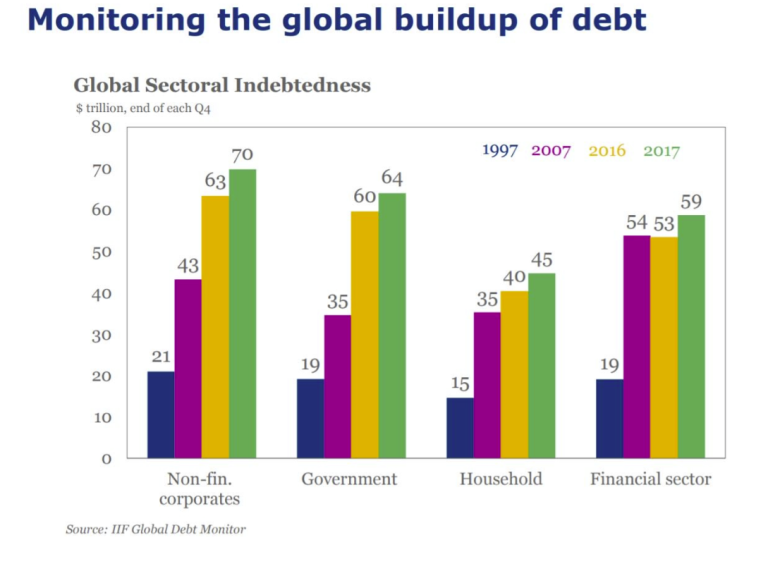 In the first three months of 2018, global debt rose 11% to a record of 247 trillion dollars (according to the IIF), and that of emerging markets soared by 2.5 trillion to an all-time high of 58.5 trillion. . When the lowest risk bond, the United States 10-year, went to 3.1%, the synchronized growth and complacent veil lifted, and t many assets showed how risky they truly are. Markets woke up to a reality that we had decided to ignore. That rates do rise. And if the safest bond gives a return of 3.2% … Am I willing to buy bonds from much riskier countries with negligible spreads? Add to that “sobriety” effect, another one. 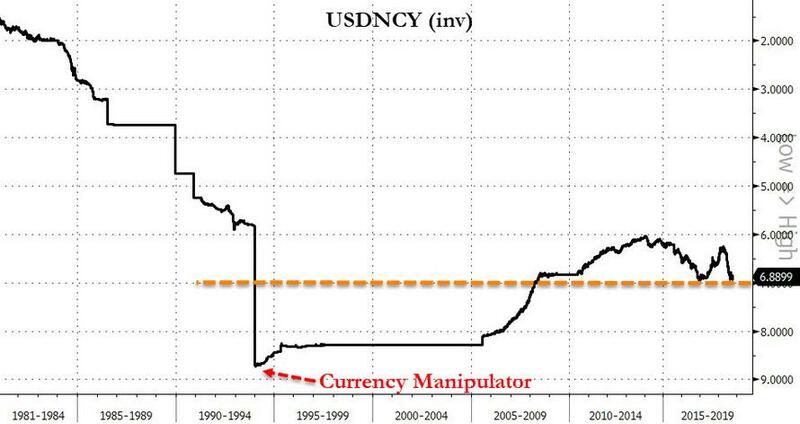 The inevitable devaluation of the yuan , which soared to almost 7 against the dollar. Am I willing to buy emerging markets and commodities when China exports its imbalances sending disinflationary pressure to the rest of the world? One, the US 10-Year, shows us the risk in the assets that we perceive as “safe”. And the other, the yuan, reminds us that China exports global disinflation and warns of impossible growth expectations. This reminds us that this time is not different. It is the same as all the previous ones. 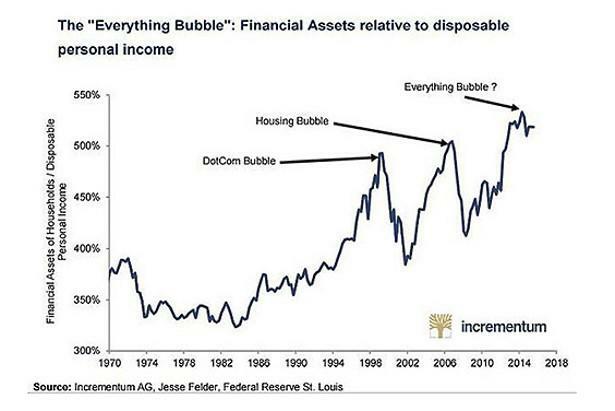 A bubble created from monetary policy gives way to a deep hangover . The US technology sector, which soared thanks to very low rates and high liquidity began to show signs of weakness, and the US market reacted by losing support levels as a continuation of the five-year lows in China and emerging markets as well as ongoing weakness in Europe, showing that the United States was not immune to the problem of excesses in other markets and that “value” in Europe or emerging markets was inexistent. These markets fell with the US -and more in some cases-. The US market might be expensive, but others are optically cheap but very expensive in reality, and as such, they fall in tandem. If we look at the 180 most important economies in the world, only six have in their estimates of 2018, 2019 and 2020 an evident improvement of their fiscal and commercial imbalances. In other words, almost no government in the world plans to reduce the rate of debt increases. If we look at the corporate sector and families, the situation is much better, because private debt is somehow more contained -except in China- and especially in terms of solvency, compared to profits and assets. Given that it is more than likely that central banks will continue to Japanize the economies through financial repression, these “red cards” are becoming more frequent and, in addition, there comes a point at which the saturation of monetary and debt measures stops working even as a placebo. Above all, the tools that central banks and governments have always used (lowering rates, increasing liquidity and increasing spending), generate very evident diminishing returns. In the past eight years, for every $1 of GDP, there were $3 of debt created. This week’s tantrum will probably recover because the incentive to continue inflating the risky assets is high. But we already have had several warning signs and we keep ignoring them . Even worse, episodes of volatility are being used to increase imbalances and generate further problems in the long-term. When societies are based on incentivizing spending and debt and not saving and prudent investment, we are always going to throw ourselves into a bigger problem based on the conviction that nothing is happening. When it bursts, governments and central banks will blame anyone except themselves. And repeat.